The royal palm tree is one of the best looking palm trees in the world. It is also very easy to recognize the tree from its unique shape and leaves. For your home, royal palm trees grace your yard with an effortless magnificence. If you need a unique and prestigious looking driveway or lane, the royal palm tree is the way to go. They make the most beautiful sidewalks. You may wonder if they’re safe to plant near roads and houses, the short answer is yes. To explain, royal palm tree roots don’t grow outwardly, therefore, will not cause cracks in the streets. Royal palm trees come in two different types, both of which do well in Brisbane QLD. Royal palm trees have broad leaves that don’t seem to be huge. They will occasionally shed leaves, but it is essential to maintain them by pruning. Your job begins the minute you decide to plant the trees. If you want excellent results, you need to invest time and commitment into caring for the plant. Royal palm tree seeds will germinate fast when adequately watered. Royal palm tree growth rate is quite rapid. It grows faster than other palm trees. Within a year, the tree will grow up to 2 feet. This means that royal palms can grow very tall, they can reach 100 feet, but in Australia, they mainly maintain 50 feet. Royal palm trees often shed their leaves during strong winds to protect the stalk. Since it is not very strong, it sheds off the weight of the leaves instead. The bark of the royal palms is very smooth. 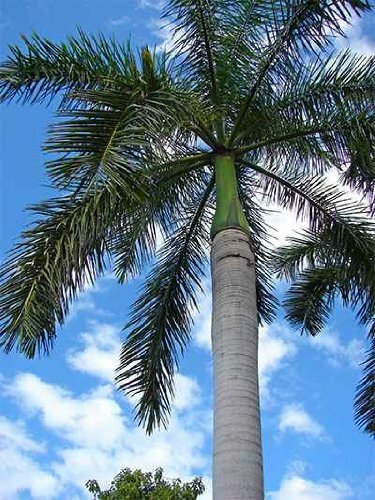 To achieve a canopy look for your royal palm trees, we recommend you contact an arborist. The royal palm tree produces both fruits and flowers. It is important to note that royal palm trees can only reproduce from pollinated seeds. What this means is that they need birds and bees to pollinate. The royal palm tree has both male and female on the same plant. The royal palm tree fruits are purple or black spheres that aren’t edible but are imperative for the plant’s reproduction. As seen in royal palm tree pictures, you can tell them apart by the nature of their flowers and fruits. How long do royal palm tree live in Australia? Palm trees typically live for many years. Mainly between half a century and a century. As for royal palm trees, they can live up to 90 years or more. Enjoy the beauty provided by royal palm trees as well as the many advantages of their leaves like making thatched roofs. When you weave the sheets together, you can make a roof that lasts over a decade. What is an Arborist and Why Should I Employ One?